Success! We are certified divers. Well, that treading water for 10 minutes and swimming 200 metres on Tuesday, February 3rd was only the beginning of one of the most exciting and eventful parts of our journey so far. 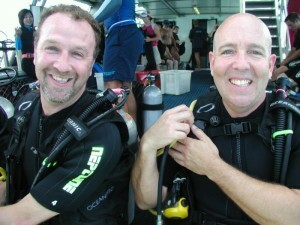 As of Friday, February 6th, 2004, John and I are PADI Certified Open Water Divers, but more of that later. Some filler detail: John booked with The Cairns Dive Center or CDC as they are known locally. They offered us a four-day “budget” dive course on the Reef which involved two days of theory and pool work, followed by two days diving on the Reef, after which you are certified (if you pass the written tests and the open water skills tests.) as an Open Water Diver. This is a limited certification and does not allow you to dive on wrecks, in certain areas, or below 18 metres. Further certification is available, the more diving you do. These tests are both physically and mentally challenging and I wasn’t so sure that I was up for the task. The class that started right after ours had a student drop out after one lap of the 200-meter pool swim! We find out later that most students do the 5-day course where, after 2 days of classroom and pool work, you go to the mother ship, which is stationed on the Reef for 1 month at a time, and you get two night’s accommodation and three days of diving. Anyone who did the 5-day course got 4 extra dives including a night dive. (Barbara Colley, you know how exciting that is!) We had already paid for our hotel, which wouldn’t refund us, so after the 2 days on land and pool, we were separated from our group and we did two-day trips to the Great Barrier Reef for our open water skills tests. Our instructor was a seasoned veteran with years of diving experience all around the world. She was professional, fun, serious about diving, and most importantly, had a wicked, wonderful sense of humour. She also seemed to love teaching new divers and took great pride in passing on her considerable expertise. She knew everyone’s names and idiosyncrasies immediately and made an extremely strenuous process fun. THANKS, LEANNE for giving us what we needed to get certified. We had a wonderful time. We are so sorry we couldn’t do the mother ship and especially the night dive with you. Thanks for finding us on the day boat and encouraging us and congratulating us after our last certification dive. We will always remember these four days. How did J.J. do??? Our time in the pool was fairly easy. I was very worried about my ears popping because I have always had problems with my ears when diving into pools. But the way we were taught, this wasn’t a problem for me. After over 6 hours in the pool (which had a depth of 4 metres) over the 2 days, we were pretty confident about our open water testing. But the first day of open water skills testing dawned with no dawn – the monsoon was going full force when we woke up. We had to be at school by 7:15 (school, by the way, was a 40-minute drive down the mountain through the monsoon, on winding, 180° hairpin turn, narrow-wrong-side-roads) to do our written exam (we both passed with flying colours). By the time we got to the dock, the rain had stopped but our view back over Cairns was of romantic rainforest clouds hovering over the tops of the Kuranda Range Mountains. The 90-minute boat ride out to the Outer Reef was turbulent, with swells of between 7 and 10 metres, and a couple of people got seasick. We both seemed immune to that particular malady. We enter the water: OMG! It is definitely not like a pool. Greg tells me he panicked because his snorkel kept filling with water. They tell you to breathe through your snorkel when you are on the surface, to conserve your air for the dive. They forgot to add that when the swells are big (not as big as on the ride out, because the effect of being on the reef is that the water is calmer but still big), you should breathe through your regulator even on the surface because your snorkel will not work if you get swamped. As well, Greg was freaked out because with the buddy system that divers use, we were supposed to stay together at all times – but with 20 other people fighting their way into the water, he couldn’t see me – I was already 1 metre under the water, forced down the anchor line we were to hold by the crowds. Unlike Greg, I was ready for the crowd – what freaked me out were the noises – who knew that air bubbles from 20 people could be so loud? Water conducts sound much more efficiently than air – so sounds are intensified. We separate from the crowd with our instructor for the day, J.P, and go through our first set of open water skills, which we’ve already done in the pool, and learn that when your instructor shakes your hand underwater, that means you’ve passed that particular skill. Then we get a swim through the reef – magnificent, six stories high and so alive that you don’t know where to look, although the brightness of everything is muted because there is still no sun today. Despite which, the neon-coloured reef fish darting here and there, are exquisite. This first dive went to a depth of 10 metres, and lasted for 23 minutes. After lunch on the boat, we begin our second dive. We know what to expect, and it goes very smoothly. We go to about the same depth but have a dive of 35 minutes this time. Again, it is beautiful down there, and this time we swim through an arch complex in the reef, called the Labyrinth, and see this time a Maori wrasse (a very big fish! ), who takes no notice of us. We hold a sea cucumber, stick small starfish to our masks and are generally in awe of the spectacle of the Reef. The ride back to shore is one of exhilaration – we have completed half our underwater skills testing. We chat with one of the crew, Michael, who has moved from Ireland to Australia with his girlfriend, to get his advanced diving certifications. Although he studied law, his passion is cinematography, and he is hoping that he will be able to do underwater cinematography. He knows Canada well, having attended Lester Pearson College on Vancouver Island. We are back on land by about 4:30, quickly check emails and update the web, grab a quick dinner, then drive up the mountain and fall exhausted to sleep. Friday starts again with the monsoon going full force. We get to sleep a little later this morning – we don’t have to be on the boat until 8:30. The drive down the mountain is worse today – it is far windier than yesterday, and it has been raining heavily since 10:30 the night before – there are lots of rock slides that we have to negotiate around. We are the first guests to the boat at 8:20, and the crew tell us that it will be an ugly trip out to the reef – the wind is blowing a steady 25 knots, much harder than yesterday, and we will be sailing into the rising tide. Sure enough, visibility is almost nil for the entire ride to the reef, and 7 or 8 people (but again not us) are seasick on the way. We chuckle to ourselves, having seen this same thing the day before. We are seasoned sailors! When we moor on the reef, it is far rougher than yesterday and even 45 kilometres offshore the rain is driving, but in we plunge with Chris, who is administering our final open water skill tests. We immediately go down to the bottom – at 14 meters, 3 metres deeper than we got yesterday. Our first test today is to fill our masks half-way with water, then to expel the water – something you need to be able to do to unfog your mask if necessary. This is something we have practiced and practiced, both in the pool and yesterday in the open water. I go first and don’t realize that when I put my mask back onto my face, the skirt on one side has folded under the lens. When I open my eyes (I do these things with my eyes closed because of my contact lens) my mask is full of water. I lift it away from my face again and blow, and again when I open my eyes my mask is full of water. This time so is my nose, and I am swallowing salt water that has come through my nose. I try one more time, it doesn’t work again, and I can feel panic setting in. By this time, Chris has grabbed my BCD vest and is holding the regulator in place in my mouth, and the only thing that keeps me from doing an emergency ascent is the fact that Chris is holding tight, and I trust that if this were a real emergency, we’d be on our way up already. He puts a finger on my mask, and I finally realize that the skirt is not sitting properly. So I adjust it, still on the verge of panic, and just sit calmly, catching my breath, letting the panic ebb away, all with my eyes still closed. Finally, I lift the bottom of the mask, blow for all it is worth, and my mask clears. Thank god! We sit quietly, Chris keeps asking (via hand gesture) if I’m OK, I keep saying I’m OK, although I’m not really feeling very OK. When I can convincingly gesture that I am really OK, he gets Greg to do this routine, and Greg, of course, does it flawlessly, the first time. We do our other skills tests and get through them with no problem, and then do our swim. I am still not totally happy to be underwater and am glad when we finally surface after 30 minutes. After lunch, we go down again. Our skill tests after lunch are full mask removal and hovering, and I am anxious to get them over – still concerned about this morning’s experience. Down we go, to 15 metres, and Chris makes me go first – he has no heart! But I do it, and do it perfectly the first time. The relief that floods over me is intense. Greg does his, getting it perfect, and then we hover. It is a bit like sitting on a flying carpet. At this point, Chris indicates we have passed all our skills, and are certified divers. We go for a swim, and it is the most wonderful swim I’ve ever taken. Pure relaxation and enjoyment and happiness that Greg and I have done this thing together. When we get back to the boat, the monsoon has finally stopped, and although the sun is not out, the water is calm. JP announces to the crew and other divers that we are certified, and there are cheers and clapping. Michael from Ireland takes the picture of the two of us. We are so happy!